Slate: Continuing this theme of new changes for Link, obviously his actions in the game expanded quite a bit this time. Most notably, he’s now able to climb anything in sight, and he also can soar with the Paraglider. And I wonder at what stage of development did those ideas came about. And what were the original inspirations for those and the goals for those abilities? Fujibayashi: When we think about the Zelda series, we first think about Link’s actions. And so when you ask at what part we started thinking about it, it would be from the beginning. That’s when we started considering Link climbing and paragliding. Since this game has an open air and the world is so open, we wanted to make sure that when the player controls Link, they could press the forward control stick and can move forward constantly. We had that in mind while we were designing. So when we were making prototypes, first we had Link go into the wall and then jump over walls or anything, but it just didn’t feel right. So then we thought, “Hey! 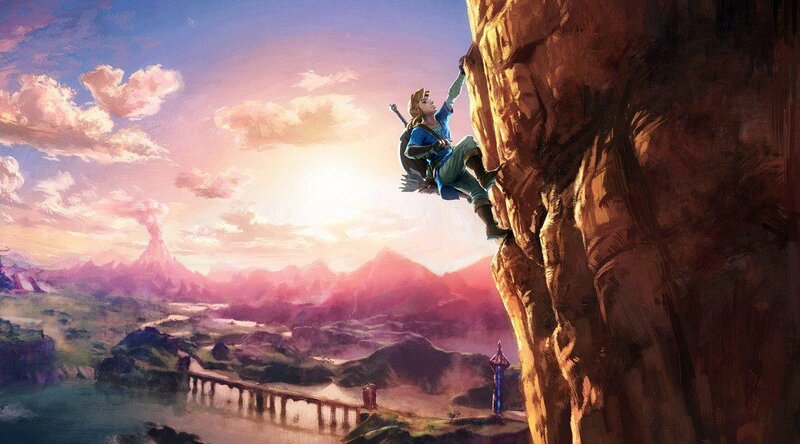 Why don’t we just make Link climb?” And also, when he climbed up the walls or mountains, he would try to climb down, but we also thought that didn’t really feel right. So then we had him just jump down, and that’s how we decided on doing that action. Aonuma: In terms of those actions, being able to climb walls and then glide places with the Parasail, those are kind of actions that had actually already existed and that Mr. Fujibayashi had created for the previous title Skyward Sword, but they were kind of separate actions in terms of how the game system worked. What we really wanted to go for here was just something where, if the player is out in the world and they push the control stick forward for movement, they can just go forever. They can climb something up, and then they can jump off and sail with the Parasail. They never have to stop moving, and it just becomes one consistent movement. So, it was those two disparate things coming together to become one flowing movement. And me watching from the producer angle, I didn’t quite totally understand it, but I was able to see that Mr. Fujibayashi had done this thing in a previous title. He tried it once, and he still felt that there was something there that was worth revisiting. And then for him to come back to this title and then succeed in this way by refining what he tried before, I think it owes a lot to what we did on previous titles. It’s amazing to hear that the initial idea was inspired partially by Skyward Sword, the previous console Zelda game released in 2011. But what do you guys think? Did you like climbing and paragliding around Hyrule? Let us know in the comments below!